Categorize actions, communication and resources…the features are seemingly endless, marvelous tool. 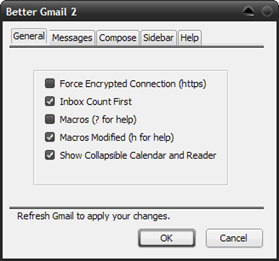 Description : This is a Firefox extension that allows you to manage multiple Gmail accounts and receive new mail notifications. Displays account details including unread messages, saved drafts, spam messages, labels with new mail, space used, and new mail snippets. Description : This cool allows you to customize the look of your Gmail inbox. Gmailskins adds the following features: Change the color/skin of your inbox, integrate your google homepage alongside your inbox (this allows you to view weather reports, rss feeds, news headlines, flickr recently added, google calendar module etc from your inbox), insert images from your Picasa web album in to your emails, insert smileys/emoticons, insert HTML tables and other complex HTML in to your emails, make the navigation (Inbox, Starred, Sent Mail, etc) appear horizontal, fix the navigation in place so that you don't have to scroll to the top of the page to see it, change the attachment paperclip (on inbox) to an icon indicating the type of attachment, and finally, hide various page elements (invite panel, page footer, your email address from the top right of inbox). 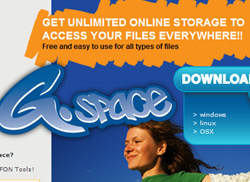 Description : Gspace turns the 2GB of your Gmail account into free online storage. 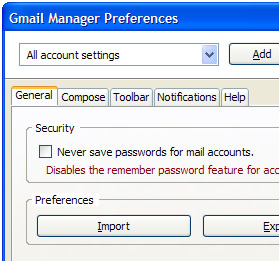 With Gspace you can manage unlimited Gmail accounts to store all type of files within its simple, user friendly interface. Simply download Gspace and transfer files between your computer and Gspace, its that simple. Description : If you are using both Gmail and Google Calendar, GCalQuickTab makes it easy to switch between the two web apps by overriding the default behavior of the new Gmail/Google Calendar links that appear in the upper-left-hand corner of those sites. If the linked webapp is already open, then it brings that tab into focus instead of opening the webapp in a new window. You can also switch apps by using keyboard shortcuts: “g” for Gmail and “l” for Calendar. Description : This very useful extension makes use of your Gmail storage and uses it for online photo storage. 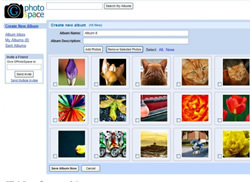 Quickly and easily, any user can store their photos online for free. And best of all very little technical knowledge is needed. 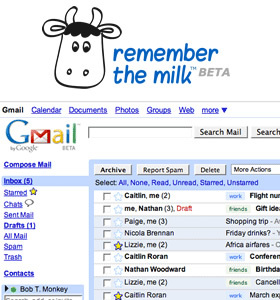 Description : Remember The Milk is a popular web app that allows you to manage tasks quickly and easily, with this Gmail addon you can add new tasks (and connect them with your emails, contacts, and Google Calendar events) and automatically add tasks for starred messages or specific labels. 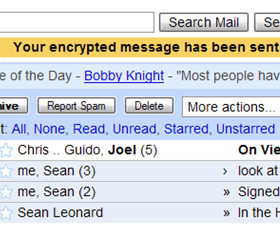 Description : With the Gmail S/MIME extension, you can send and receive signed and encrypted S/MIME messages in Gmail. It not only secures your e-mails, it even protects your attachments. Description : With this simple, but useful addon,you can easily select your contacts from the Contact Book by clicking the little book icon next to CC and BCC Boxs. Description : This extension replaces text-smileys with the image-smiley variation that that you want (the smiley list is editable). 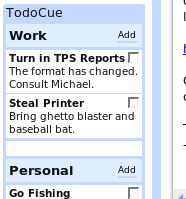 Description : TodoCue is a free web app for creating simple todo lists, simply download the extension and your to-do-list will appear within Gmails sidebar. 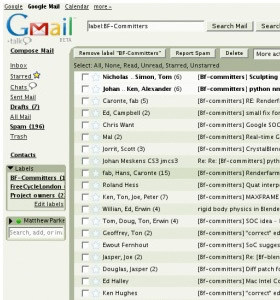 Description : Another small addon that allows you to monitor multiple Gmail accounts right inside your browser's UI. Description : When searching online for a job, and you need to quickly and painlessly send a job application or CV, then this addon is for you. “Right Click” and select “Send Job Application to…”, and that is it, you have applied for a job. 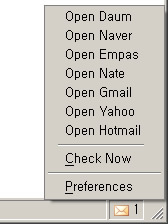 Description : WebMail Notifier checks your webmail accounts and notifies you of the number of unread emails. 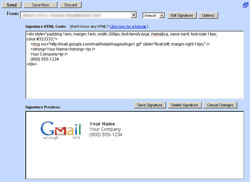 Description : This tiny extension automatically inserts HTML signatures into your Gmail messages based on which address you are sending from. Works for Compose Message and Reply/Forward. 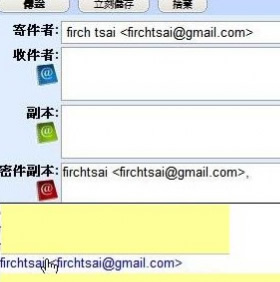 Description : Email This! will send your recipient the link, title, & highlighted text of the page you are viewing via GMail. Description : Send web links, send text, or send an image on any webpage you are currently browsing, and email it to anyone you want. 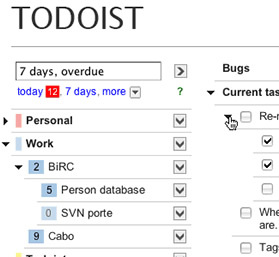 Description : Todoist is a popular online task manager that is useful, fast and easy to use and it also comes with an addon that integrates easily into Gmail. 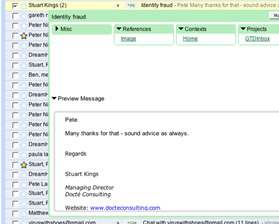 Description : A simple tool that checks for new emails in your Google Mail and Google Apps (Gmail for Domain) accounts. 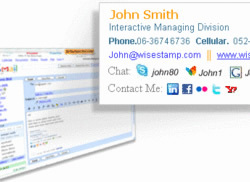 Description : WiseStamp enables you to easily customize & add personalized email signatures on any webmail service (Gmail ,Yahoo Mail ,AOL mail, Hotmail, Google Apps…). Description : This extension gives you more screen space for your messages, Gmail advertisements take up a lot of space even if they get blocked by other addons because they leave unused empty space.